The kids got Dad a snazzy new tie for Father’s Day, but they can’t find him. Help them navigate through our fun, printable maze to find Dad! Click to view and print the Fathers Day Maze full size. 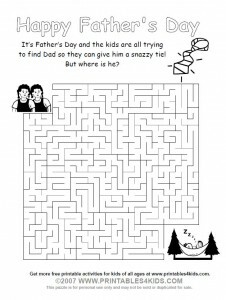 Or download the Father’s Day Maze as a PDF file. Don’t forget to check out our Printable Tools and Tool Box activity for Father’s Day, too! Check out this terrific source for retro bowling shirts, along with tons of other cool and unique retro gifts! Thanks for putting that up, appreciate the resource. Anything to get the kids away from the computer for a while and using another part of their brain.